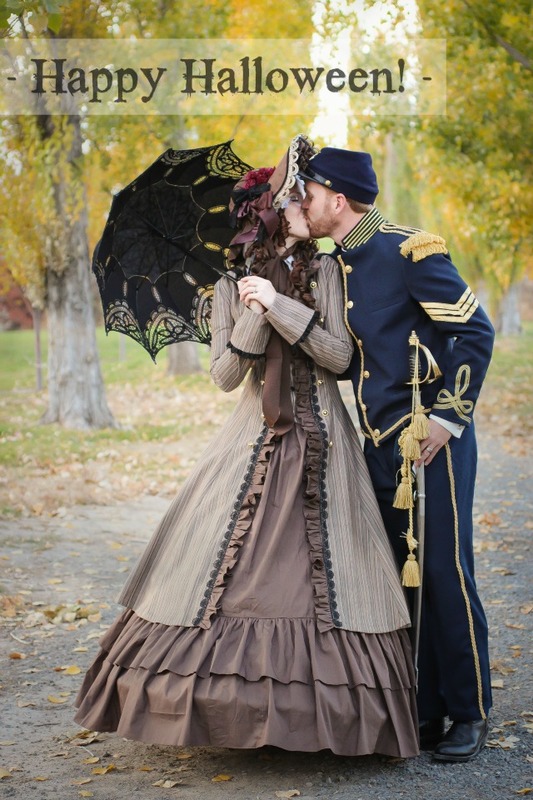 Martin and I settled on another handmade idea this time around: Civil War Couple:) What did you and yours settle on?? Here's wishing you a spooky and sinister Halloween! This couple costume is so cool! And such a cute photo! This is absolutely beautiful !! You both look fantastic :) well done ! Best costumes ever!!! You're SOOO creative and talented!!!!! Wow! That looks like a LOT of work, Em! Love the detail though - it looks period authentic! Well done! Wow! Those are awesome costumes!!! I love them :) Happy Halloween! This is amazing! Wonderful job, Emily! those costumes are incredible!!!! you made them? wow! How awesome! I can never get my hubs into dressing up. So cute! Love it! Simply the best! I love your costumes! You guys look fantastic! And such a great picture! That is awesome! BEST costumes!!! You pick the most creative costumes. No chance in getting my hubs to dress up. Love your Halloween costumes, you give justice to the outfit on civil war era.You're so creative! My goodness!! That is GORGEOUS! am so anxious for the details post! Wow.. Amazing photo and costume too!! amazing costumes. did you make them yourselves?